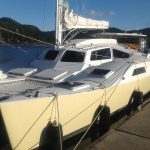 There are many catamaran upgrade projects you can do to enhance a stock manufactured catamaran designs to make it faster, more comfortable, and easier to sail. Here are some of the ones we have added to our cat, Light Wave, to make her a better boat. **NEW PROJECT* Adding 5 feet in the *Middle* of Your Catamaran [see video! In 2013, after 4 months in the boatyard, we have lengthened our catamaran to 37 feet! It was either sell Light Wave and find another boat so we cut our boat right in half and then added a five foot plug so we could create a passageway between the hulls effectively joining the whole boat together. It was a bigger project than we expected (it took 4 months and 1,000 hours…) , but we now have almost a new boat: roomier, faster, and nicer looking. So if you ever wanted to know what you could do with SawzAll reciprocating saw and lots of epoxy, watch this new video as it redefines extreme boatbuilding! This was our most radical modification (until we cut in half in 2013, see above) and we did it in May and June 2007 in a boatyard in Guayamas, Mexico in the middle of our 2-year cruise. This modification is not for the faint of heart but we think will make a huge difference to the comfort and sailing on Light Wave. Here is the full article which is an excerpt from our month-by-month catamaran cruising log. In the damp Pacific Northwest weather of fall, winter and spring (and maybe even summer! ), we have found that all types of polartec / polar fleece clothing works the best. In the colder and damper months we only wear this stuff. From caps, sweaters, pants, and shirts everything is out of this miracle fabric. A couple of years ago we made an even bolder move and started using several polartec blankets instead of sleeping bags. After a few days our sleeping bags used to become increasingly soggy and uncomfortable. Not with Polartec, it just stays dry because it does not absorb any moisture. We went even a step further and recovered all our settee cushions and bunk cushions with Polartec. All I can say is that we would never go back to anything else. Even in the hot summer conditions of Mexico they are still cooler to lie on then cotton covers. We did all the sewing ourselves after we had a local foam shop cut the foam for us. The polartec was bought from an outdoor clothing shop in Vancouver but it is also available on the web.